This chapter explains how to setup WinGDB for debugging and building programs for embedded Linux systems. In this scenario the sources are stored and built on Windows using a cross compiler. You will need a toolchain, a specialized bundle of development tools for your embedded system. A toolchain usually includes the compiler, linker and debugger, as well as other tools. After compiling on Windows, the binary is transfered to the device and executed there. The GDB debugger is then executed on Windows and connects with its on-device counterpart (called "gdbserver"). This situation differs from remote Linux development in sources and tools location. To conserve space on the device, all of them reside on local Windows host machine. Only actual binaries are copied onto the device. You can also work with embedded Linux using WinGDB without any special project type. Just use any C++ project type that Visual Studio offers, e.g. Console application. This facilitates on-host testing possible with some embedded platforms, where special libraries emulate various aspects of the device. Simplified way: right-click on desired project and choose Project configuration wizard option from WinGDB menu. It will open a wizard which will guide you through most important configuration steps. Choose the "Generic Linux system running on embedded or mobile device" option on the first page, then follow the instructions presented by the wizard. It is intended for easy starting and does not cover all options. Later you can tweak any option using the detailed method described below. Currently this method is applicable only to projects, there is no equivalent for whole solution. To be able to debug with WinGDB, you must let it know the debugger location. To set that information, choose Preferences option from WinGDB menu. There is Default debugger location field in the preferences. You can enter full path to the debugger executable, or only the executable name. In the second case you have to configure your PATH variable on Windows host, so that the executable can be found. To be able to build programs under Visual Studio, the location of the tools used for building (like the compiler, linker, make, etc.) must be known. This can be done either by appropriately configuring the system PATH variable, or by specifying paths to search in Default toolchain location field in the preferences. Multiple paths can be entered, separated by a semicolon. Alternatively you can specify these paths in project or solution properties (Build toolchain paths setting on Environment tab). This will override the global setting described above. Thus, you can use a different toolchain in different projects or configurations. To return to default toolchain, reset the Properties setting to default value. The most important properties adjustable for a project or solution, are Target Type and Debug target login. Other machine roles (Debug Host and Build Host) are fulfilled by the local machine, so you do not specify the logins. WinGDB supports many possible scenarios of debugging with GDB. You have to select which one suits you. In this case, it will be Embedded Linux system (gdbserver). Your embedded device may provide some shell access allowing to log in and perform operations. It is not required by WinGDB, but if present, it enables additional features: remote file system browsing and automatic gdbserver launch (see below). The only protocol currently supported is SSH. There are plans to add some other protocols in subsequent versions. Linking - the linker needs to access the libraries to retrieve names and locations of routines. Runtime - the program executes actual code from the libraries. Debugging - the debugger needs to access debug info and additional data stored in a library. For typical server/desktop Linux development, in all of these cases the libraries reside on Linux host. But when using a cross-compiler, situation is more complicated. Generally a copy of each library must be located both on the target device and on host system where the development is performed. The root directory where all system libraries are located is called sysroot. There are two sysroots: the one on target device and another one on host computer. The files contained in these two directories should be identical. You must specify locations of these directories in Sysroot on target and Sysroot on host fields. Otherwise GDB won't be able to locate shared libraries and some debugging options may not work. Sysroot on target may be equal to the filesystem root directory on the device. It's not recommended however, as toolchains often come with their own versions of system libraries. In order to debug embedded Linux programs you will need a special program called gdbserver. It should be included in your toolchain. It must be installed onto the device. Usually it is bundled with all the libraries in the sysroot. Please consult your toolchain documentation for details. Automatic start: WinGDB will launch gdbserver automatically before the debugging starts. Requires SSH connection capability and the Debug Target Login field to be properly set. You have to specify also the path to gdbserver executable in Path to gdbserver field and the port that gdbserver should listen on in Server port field. These settings are located on Server tab. You need not to enter the target specification, as WinGDB automatically will use proper target remote or target extended-remote specification. You can also specify port forwarding. Use this option when the port gdbserver is listening on is visible on the debug host machine under different number. It can happen when using some special communication protocols, like TCP over USB. Some mobile devices use such protocols. To enable port forwarding, set the Server port is forwarded and enter host-visible port number in Forwarded server port field. Typically this feature is disabled. Manual start: you will have to start gdbserver manually. Does not require SSH connection. You will have to enter proper target specification in the Target specification field. This is exactly the same information as you provide for target command in GDB. Optionally, if you have SSH connection, you can easily start gdbserver in this mode using Start GDB Server from WinGDB menu. If you do not have SSH, you must start gdbserver using other means, depending on your device (e.g. serial console). Launch process mode: gdbserver starts your program for debugging immediately after its own start. This is the recommended setting. Attach to process mode: gdbserver attaches to existing process on the device. You have to enter the process identifier in the PID on target field. A better method is just to use Attach to process option in Visual Studio, where you can select the process from a list. However, if you do not have SSH connectivity, you can fall back to this method of attaching. If you use manual start mode, the above option has to be properly set as well. WinGDB must know how to interact with gdbserver. The remaining options are specific to the automatic server start mode. If the gdbserver executable is located inside the sysroot package, some special actions must be performed to start it. WinGDB does them if Launch server from sysroot option is turned on. The dynamic linker is used explicitly and shared libraries required to run gdbserver itself are loaded from the sysroot, not the system-wide location. You can specify relative location (to the sysroot) of the linker and the library directories, in Sysroot dynamic linker path and Sysroot shared library paths. Also the path entered in Path to gdbserver should be relative to the sysroot. In case of CodeSourcery Lite toolchain (and probably most others) the default settings should be appropriate. WinGDB has a simple mechanism to control compilation using make or any other build system. It works both in remote and local mode. It can start any build command, however if you want to be able to locate errors and warning in the source code, the build command output must be compatible with standard make and gcc message format. For best results, use standard GNU make. Project build command: a command to launch when the Build menu option is choosen. By default, make. Project rebuild command: a command to launch when the Rebuild menu option is choosen. By default, make clean; make. Project clean command: a command to launch when the Clean menu option is choosen. By default, make clean. Project deploy command: a command to launch when the Deploy menu option is choosen. By default, make install. In embedded system mode this is only optional step, sometimes useful when you have some custom deployment method. Other possibility is to use Transfer file to target option (see below). Build working directory: where the above commands should be launched. Build environment variables: additional variables to be set in the environment. You can use this setting e.g. to pass the configuration name to the build system. Build before start debugging: if enabled, WinGDB will try to build current project or solution before starting debugging. This reflects Visual Studio behavior and is useful when you are making corrections in the code and test them immediately. Deploy before start debugging: when enabled, WinGDB will also run deploy command or copy files before starting the debugging, if the build has been performed. Deploy action: selects the action performed on deploy. Currently there are two possible choices. Transfer file to target copies specified file (or multiple files) to the target system using SCP or SFTP protocol (SSH connectivity required). Run deploy command runs custom command specified in Project deploy command field. Deploy only if file changed: avoids copying deployable file when the file has not changed since last deploy. In Run deploy command mode, the command is run if any of specified files has changed. Files to deploy: specifies file path (or more paths, separated by a semicolon) to be deployed and/or checked for changes before deployment. Deploy target directory: specifies destination directory on target system for deployed files, when using Transfer file to target mode. If you click on solution instead of project, there will also be shown another tab, Solution build. On that tab there is a similar set of options, this time concerning the whole solution. There is also one new option, Solution build mode. You can choose whether the soluton build will execute a build command for each project (with respect to their dependencies), or run build commands configured by the remaining options. Use the first possibility when you do not have a separate makefile for the whole solution, and the second one when you do have. 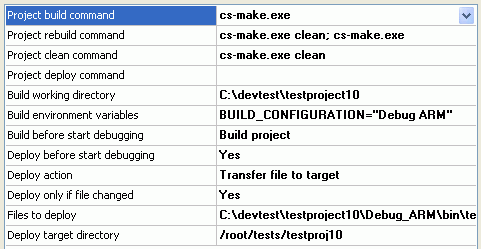 Apart from Solution build, there is also regular Project build tab. On that tab you can set default settings for the projects, which can be then selectively overridden on any project settings page. To start the build, choose one of options from the Build submenu from WinGDB menu on any project or solution in Solution Explorer. You will see results in the console. When you click on an error or warning, the code editor will jump to appropriate place in the code. You can also use Rebuild and Clean and Deploy options to perform these actions. Run deploy command mode: Runs an external command. This facilitates deploying by means of external script or make rule. This mode works in exactly same way as other remote build actions (Build, Rebuild or Clean). Transfer file to target mode: Transfers specified file (or multiple files) to the device. The target copies will have executable bit set. This option requires the Debug target login to be set, as well as two additional settings specifying source and target file locations: Files to deploy and Deploy target directory. When copying multiple files, separate the paths with a semicolon. All of these files will be copied to single target directory. You can initiate deployment either manually (using Build/Deploy command) or automatically, before starting debugging. To enable automatic deploy set the Deploy before start debugging setting. Both deploy modes can be configured to skip automatic deploy step when specified file has not been changed since last deploy. To enable this, set Deploy only if file changed option. In this case, Files to deploy must be set also in Run deploy command mode. Note that the skipping will be performed only whe performing automatic deploy. You can always force deployment using the Remote deploy option. Most options described above exist both on project and solution levels. The Deploy before start debugging option exists only for projects as it is coupled with the Build before start debugging option. Automatic deploy will occur only when automatic build has been performed (otherwise there would be nothing to deploy) and the deployment scope is the same as for the build: project deploy for project build and solution deploy for solution build. To launch a program in debug mode, WinGDB needs to know the full path of the program both on the host and the device. You specify the first one in the Executable path field on Debug tab. You can also set some optional parameters, like program Arguments, additional Environment variables and Working directory. If you set Stop in main() option, the program will stop at the beginning of main() function. This option is added for convenience, as you can achieve the same effect by setting a function breakpoint in Visual Studio before starting the program. Use Attach to process from WinGDB menu: recommended way. Allows to select a process from list of processes running on the target machine. Requires SSH connectivity. Use Attach to process from Visual Studio menu: deprecated way. Allows to select a process from list of processes running on the target machine. Requires SSH connectivity. Displays standard Visual Studio dialog which has limited functionality. Start gdbserver manually in Attach mode, then use Launch process from WinGDB menu. Does not allow to select a process. Does not require SSH connectivity. Launch server automatically must be set to No, and Server mode must be set to Attach. Mobile devices are usually conected to host computer through USB interface. This can make debugging slow, especially when the program is non-trivial and the number of stack frames and local variables is large. USB links tend to have high latency and GDB serial protocol is not efficient in this case due to large number of small packets being transmitted. WinGDB offers a mechanism to accelerate the communication. To turn it on, switch Enable protocol controller to Yes. This mechanism work only for TCP connections. It will not make much difference on already fast links (Ethernet), however for USB devices like Palm webOS ones the speedup should be noticeable. Since this feature is relatively new, it still might contain bugs that have not yet been detected, in spite of thorough testing. If you experience problems (most likely manifesting as hangs), please contact wingdb@wingdb.com. The accelerator has a diagnostic mode, enabled by entering non-zero logging level to Protocol controller log level field, and a path to the log to Protocol controller log file. Please include the log file in your report. For best results set the level to 4. During normal work disable logging by entering zero log level, as logging decreases the performance. Devices running embedded linux systems forms a very broad range of platforms: mobile phones, microcontrollers, network routers, and many more. It's not guaranteed that WinGDB will work without problems with every such device. Up to version 1.8, we have tested it on ARM-based development boards and CodeSourcery Lite toolchain for ARM. If you need support for different processor or toolchain, please contact us. In the table below, there are listed configurations that we tested WinGDB on with success. If your configuration is not listed, it does not mean it won't work. We just were unable to test it due to lack of access to particular hardware. Usually the compatibility depends more on toolchain used than on the hardware. We encourage you to test WinGDB on your configuration and contact us in case of any problems.